Long necklaces are so much fun, and lariats are a perfect style to capitalize on this long, lean line. 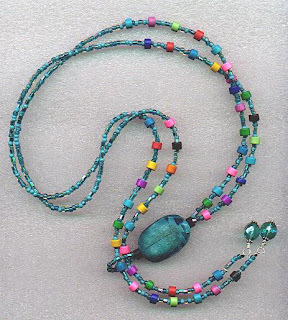 Grab a handful of accent beads in ocean colors, and you can put together a fun necklace for a breezy summer day. 1. 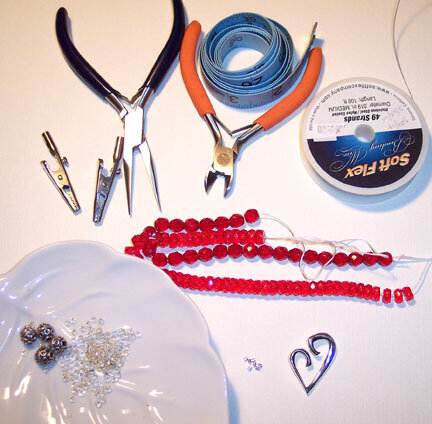 String a crimp tube and 19 of the 11/0 crystal ab seed beads onto one end of your beading wire. Pass it through the bail of the seahorse charm and back up through the crimp tube. Snug up the beads and flatten the tube. 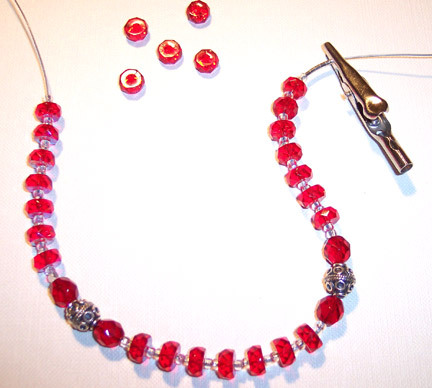 Add a silver glass tube bead and 10 more seed beads. Bury the beading wire end in these beads and clip it off. 2. Choose one of your three types of larger accent beads (the 6/0 blue seed beads, the flattened ovals, and the side-drilled lentils) and string it on. 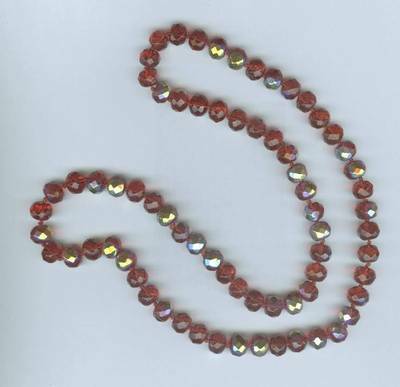 For the rest of the strand, you will alternate sections of smaller 11/0 seed beads and 4 mm tube beads with these larger accent beads. Add the equivalent of 15 small seed beads between the accent beads, randomly substituting a tube bead for 5 seed beads. Add the accent beads randomly as well; try to avoid the look of a regularly repeating pattern. 3. When you have beaded approximately 28 to 30 inches of the wire, end this strand with 10 11/0 seed beads and a tube. Add a crimp tube and 19 more 11/0 seed beads. Pass this strand through the bail of your pendant, and thread the wire back up through the crimp tube. Pull the wire snug and flatten the tube. 4. 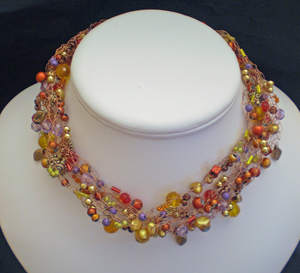 To begin the second strand, add only 10 11/0 seed beads before stringing on your first accent bead. Then return to the pattern of 15 small beads between each accent bead. This first shorter section will allow the beads on the two strands to be somewhat offset from each other. When this strand is also approximately 28 to 30 inches long, end it with 10 11/0 seed beads and a tube. Add a crimp tube and 19 more 11/0 seed beads and set it aside. 5. On each of your two head pins, slide on a 2mm sterling silver round, a daisy spacer, a flattened oval bead, another spacer and another round. Create a wrapped loop at the top of one, making the loop large enough to be a bail. Create a smaller wrapped loop at the top of the second, wrapping it around the larger loop of the first. 6. Thread your wire with the seed beads at the end through the larger loop, passing the wire back up through the crimp tube and a few more of the beads. Pull the wire snug and flatten the crimp tube. Clip off the wire end close and bury it in the next bead. All year long, Beading Arts brings you the best, most innovative, creative, and NICEST bead and jewelry makers for you to drool over! I put out a call to those who have shared their passion and creativity with you in the past, and here are the results: special offers and unique gifts for all! Therien Polymer Clay Arts 25% off all orders of Memorial keepsakes placed between now and the end of the year. 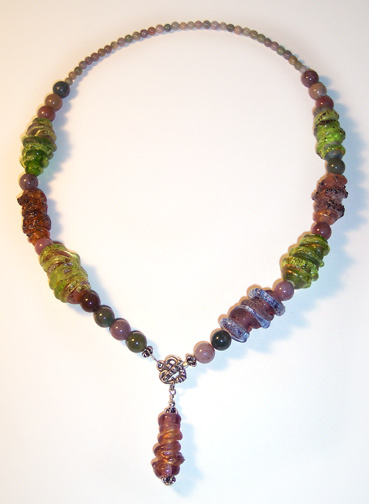 Calico Juno Designs 20% sale on all jewelry, use the discount code "beading arts", through the end of the year. KELLYM.Jewels Starting Friday, November 25, 2011, free shipping on all orders and take 10%-20% off our entire collection! Plus complimentary gift wrapping on all orders! ChezChani Fun gifts for your favourite people, including yourself! Unique Jewelry and Components Beautiful finished Jewelry for gift giving or Components for creating your own designs. Bliss Designs We love pearls! Use Coupon Code 20BLISS for 20% off everything purchased online. 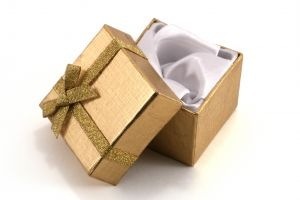 Always Free shipping, gift wrapping by request. Heirloom quality freshwater pearl & sterling silver jewelry. Mary Tafoya's Seriousbeadin' Unique, vintage and handcrafted supplies for the discerning craft fanatic! Vintage sequins on the strand, vintage rhinestones & beads, ethnic and natural components for your one-of-a-kind jewelry creations. Beads of Courage Artist Gallery Support Beads of Courage programs this holiday season and receive free shipping on orders over $50 through the end of the year. Use code 11BEADART at checkout. Pacific Jewelry Designs Where you can find the perfect jewelry for Holiday gift giving or those great Holiday parties! For the entire month of December just enter code holiday20 at checkout for 20% off your entire order. Remember, worldwide shipping is always free! Nandi Designs Jewelry From now until Jan 26 2012, Beading Arts readers can get 20% off their jewelry purchase by using the code beadingarts11. Jean discovered a very special pendant that expresses the way a person feels in a very special, amazing way! Combine those jewelry techniques - this time with wire and fused glass. 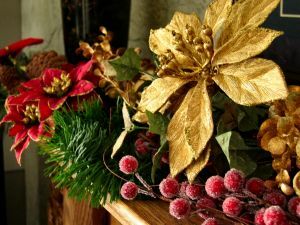 Gaea's ceramics pair up with Vintaj Brass to create some gorgeous Victorian Christmas jewelry inspiration! This week Carmi shares some useful information about resin and cold temperatures. Happy Thanksgiving to all my friends who live in the USA! Though everyone around here will be lying on the floor and groaning from too much turkey and trimmings, I still wanted to share some more designs with you that I thought might give you some ideas for your own work. I'm not suggesting that you reproduce these designs exactly, but instead that you think about the elements that we've been talking about (listed above) and see how you might include some of them in your own work. There aren't even tutorials available for all of these pieces, but most are simple enough to figure out! 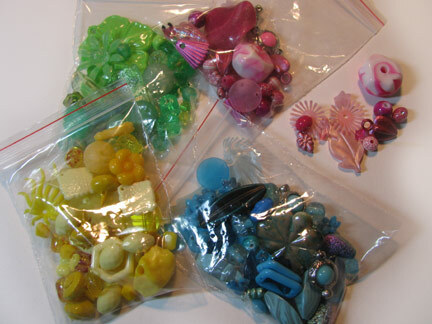 The beads are made from fabric, fulfilling the first directive, to make your own components or beads. Multiple strands and some bold color combos too! Unusual materials...got to eat a lot of fortune cookies too! 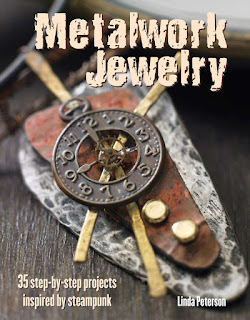 Whether you like industrial chic, mixed media jewelry, or steampunk, Metalwork Jewelry by Linda Peterson has some projects that you will love. 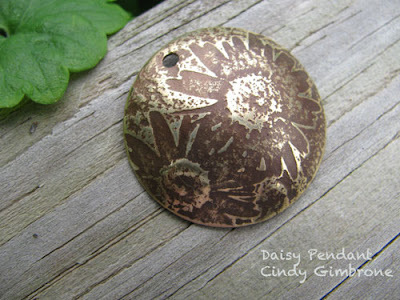 Her techniques section is very helpful, including information on doing simple soldering by either torch or soldering iron, making some simple wire findings, using a dapping block, etching with ferric chloride, and adding a patina with ammonia and salt! Linda mixes lots of unexpected materials with metal in the projects section of her book. I particularly liked what she did with Friendly Plastic, wire stitching, alcohol inks, textured and shaped aluminum cans, metal mixed with denim and other fabrics, soda can tabs, resin, and wire with found objects. My very favorite project is a simple pair of etched and domed earrings that you'll find on page 46...take a look and tell me what you think if you get a copy! This is another winner from Cico Books. Thanks for all the inspiration, Linda! My friend Eileen Bergen, over at The Artful Crafter, has shared this fabulous tutorial with us! Isn't this set just perfect for autumn? All the details for making your own set, including the step-by-steps and a precise materials list can be found at the link above. Thanks, Eileen! Beautiful toggles just beg to be worn in the front! This asymmetrical design features large lampwork glass beads that suit the front closure style, and small round beads to keep your neck comfortable. 1. If your lampwork beads are different colors or styles like mine, arrange them into a pleasing pattern, with one group of three beads, one group of four, and one single bead left over for the dangle. 2. 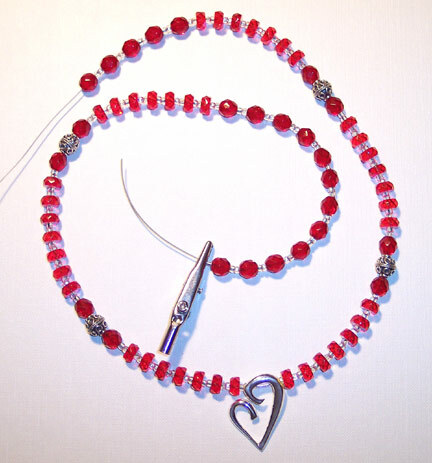 Cut a 24 inch piece of beaded wire, and crimp it around the heart-shaped toggle loop. Slide on a silver squash bead and four fancy jasper 8mm rounds. Clip the end of the wire so that it stays buried in the beads. 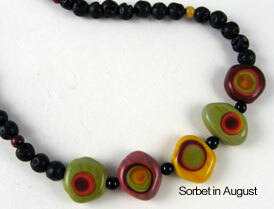 Add your group of three lampwork beads, alternating with 8mm rounds. Finish with three of the 8mm rounds. 3. In order to have the necklace feel comfortable around the back of your neck, string on all 35 of the fancy jasper 4mm rounds. 4. 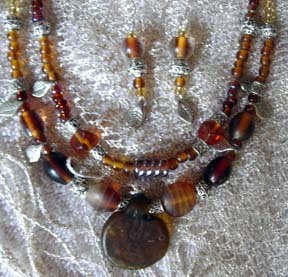 Add three fancy jasper 8mm rounds, and then add the group of four lampwork beads, alternating with 8mm rounds. Finish with two of the 8mm rounds and a silver squash bead. 5. Slide on a crimp tube and the toggle bar, take the wire back through the crimp and a couple of beads. Crimp the wire firmly and clip the end close. 6. Slide your remaining lampwork bead onto the headpin, surrounded by silver squash beads. Add the 2mm silver round, and create a wrapped loop, filing any rough edges. 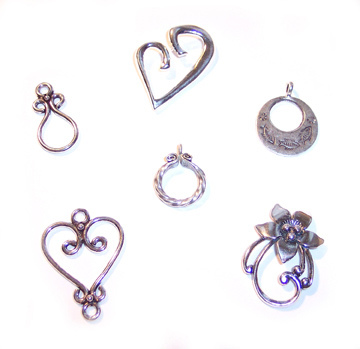 Attach the dangle to the heart-shaped toggle with the jump ring. Next up in our November series on making your strung jewelry truly unique is my friend Michelle Mach. You'll know Michelle from Beading Daily, and also from the wonderful blog hops that she sponsors. Michelle graciously gave me permission to share these terrific projects with you. If you can only afford a single strand of beautiful borosilicate glass beads, what should you do with them? Michelle chooses to wear them in an asymmetric style, featuring a stunning clasp. 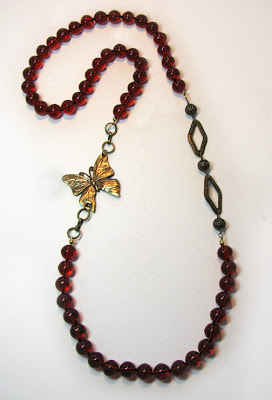 Multiple strands of relatively inexpensive beads make a wonderful support for a gorgeous pendant! Combine some unusual playmates to create a bright, fun, casual design. I'm so excited! The next wonderful volume in Lark Publishing's Master Class series came out in August, and it's a beauty! Maggie Meister has authored Classical Elegance, a gorgeous set of projects inspired by Maggie's love of classical architecture, mosaics, tiles, and jewelry. It is probably best if you already have some beadweaving experience before you tackle most of Maggie's designs. Still, there are very clear instructions for many beadweaving stitches included, so an extremely motivated and patient beginner will be able to reproduce some of the projects and work up to the more advanced ones. Even the most difficult are composed of smaller components joined together. Maggie shows you how to combine the different stitches, flowing from one stitch into another, which may be exactly the step you are missing to take your own beadweaving designs to the next level. Gorgeous gorgeous projects and solid technical information...this book is inspirational in all the right ways! Lark Publishing has made several resources available to help you decide about this book: they have posted two free projects and an interview! Special BONUS project for the Fiore Earrings, NOT included in the book! My friend Stacey Gibson shared a seed bead pattern with me recently that I think you will enjoy very much. She has created a flower garland rope pattern which is for sale both at Bead Patterns and in her Etsy shop, Unbridled Design. She has also come up with a very clever clasp design that she calls a bauble 'n' loop, which is available for free at the Bead Patterns link above! Pretty, huh? Is there no end to what can be done with spiral ropes? This year my friend Lori Greenberg, after having worked with the non-profit Beads of Courage for some time, started their online Artist Gallery, ArtistsGive.com, to help them raise money for their programs. Beads of Courage provides arts-in-medicine programs in over 100 hospitals around the world for children facing life-threatening illness. The program provides handmade beads for each treatment, procedure and milestone a child experiences in the process of treatment. Each bead serves to honor their STRENGTH and COURAGE. Kids average 500 beads in the course of a cancer treatment! 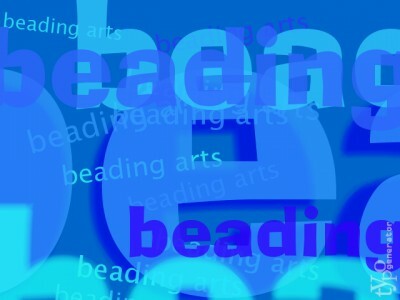 You'll be able to find the BOC banner in the sidebar of Beading Arts...this link will take you to the ArtistsGive.com, the official online artists gallery for BOC, where you can select from dozens of handmade beads and finished jewelry. All items on ArtistsGive.com and the Beads of Courage gallery are handmade by supporting artists and proceeds help support Beads of Courage programs as well as the arts and artists. My eyes are not quite what they used to be! Although I don't need glasses full-time yet, there are times when I need a little help. That is how this project came to be: my drugstore glasses needed a place to hang around where they'd be handy. I don't like the typical eyeglass holders where the glasses hang from both ear-pieces and get in my way, banging around. Instead, I was always hooking the glasses down the neckline of my shirt. How much nicer it would be to have a loop hanging just a bit lower where they could hang without unbuttoning my blouses for me! This project is for a beginner stringer. If you already have experience, you could easily substitute any other beads that you choose to make the design as complex as you like. Just follow the basics proportions given. Following these directions exactly will give you a 24 inch continuous loop that you'll just slip on over your head. It has a looped toggle or charm hanging from it so you can stash your glasses when you don't need them. This is a necklace you'll want to be wearing whenever you work on other beading pieces! 1. Cut your beading wire to 36 inches and place an alligator clip securely about 5 inches from one end. 2. String on 5 sterling silver 2mm tube crimps, but do not crimp them. 3. 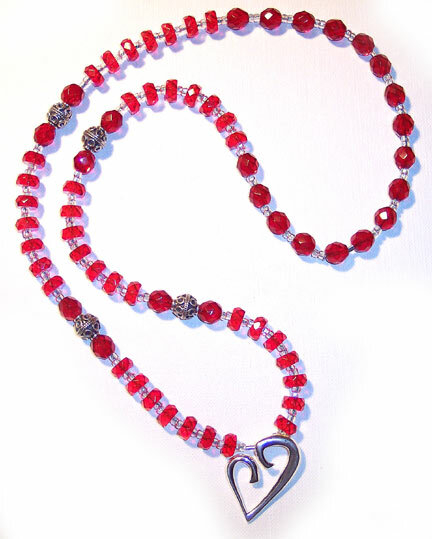 String 8-1/2 inches of Czech crystal rondelles, alternating with seed beads and accented by 2 of the 10mm silver beads, in a pattern that pleases you. 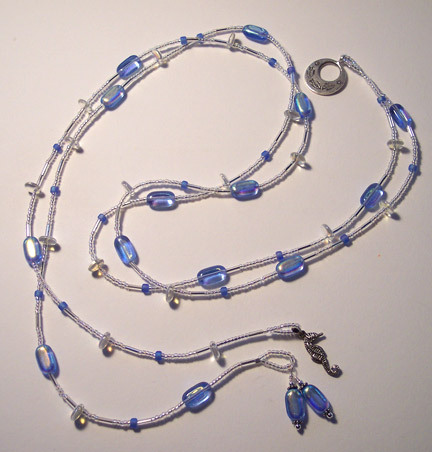 In my example, I have strung 2 inches of rondelles, then a silver bead flanked by 2 round crystals, repeating the pattern, and ending with another 2 inches of rondelles. 4. 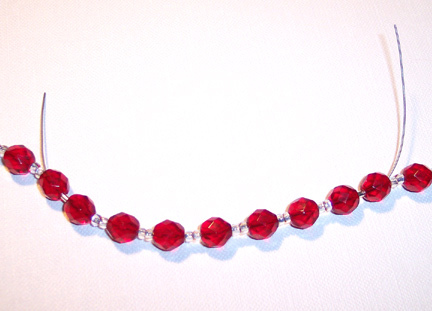 For the next 2 inches, string only round Czech crystals alternating with seed beads. Add a 2mm tube crimp bead. String 3 more inches of round Czech crystals and seed beads and add the last crimp bead. 5. Place an alligator clip securely at the end of your work, and begin stringing from the other side. 6. Slide the small loop of the toggle over the 5 central tube crimps. Allow it to hang loose. Begin stringing and match the pattern that you created on the first side in step 3. 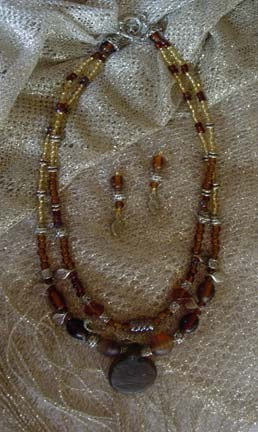 In addition, string 2 more inches of round Czech crystals alternating with seed beads at the end. 7. Take the loose end you were just working with and pass it through the beads and crimps on the other side until you have passed the second crimp and one round Czech crystal. 8. Pass the other wire end through one round Czech crystal. 9. Pull the wires snug, and flatten or crimp the crimp tubes. Clip the wires close to the work and ease the ends into the next bead. Last week, I challenged you to think about different tactics that you can use to make your own handmade beaded jewelry unique. I am so excited to tell you that several of my extremely talented friends have stepped forward and offered to share not only inspiration pictures, which was all I really was expecting from them, but also TUTORIALS to go with almost every design!!! Wow! If some of them catch your eye, remember to vary the materials, colors, and exact design in order to make the results truly your own! First up is my friend Tammy Powley. 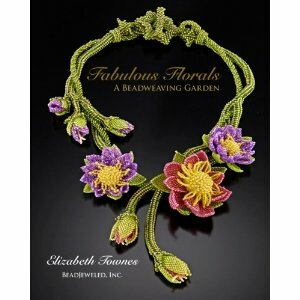 You'll know Tammy as the About.com guide to jewelry making, and as the author of many many books on beading and jewelry! Thank you so much for these wonderful projects, Tammy! Tammy shows you how to knot between beads and then connect the ends so that you have no clasp and can just pull it over your head to wear. Tammy made a beaded strung necklace and then extended the length with a large piece of chain. You can wear the chain in the back or pull the necklace around and wear the chain on the side. This is a great example of working with asymmetrical designs. 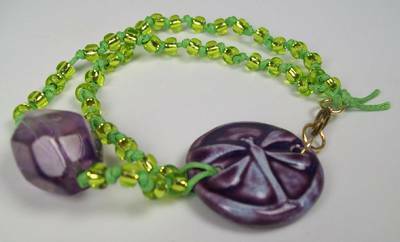 Use a ceramic piece as the focal along with a large chunky amethyst beads and string on a double strand of glass beads onto leather. 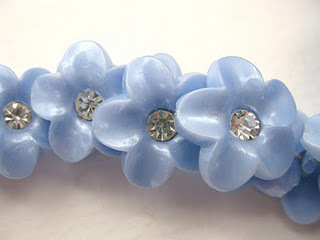 The clasp connects to the front of the bracelet. Tammy has used a very bold color combination here! Learn to make pumpkin beads using polymer clay, and then string them up onto a necklace. Need I mention that Tammy is showing us how to make our own unique beads here? Since it's too late for Halloween this year, consider what you could make for Christmas! Kay, of Kayz Kreationz, sent me this gorgeous picture of a unique bead stringing design she made. The donut was wire-wrapped and the earrings are lengths of copper chain with beads at the end. I love the copper loop spacers that she's used! This set is up for grabs on Kay's etsy shop right now (see the link above). 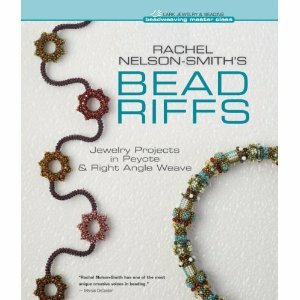 I love all the books that are included in Lark's Beadweaving Master Class series, and Bead Riffs is no exception. This time it's kind of funny though, because I really don't like jazz at all, and jazz metaphors and imagery is what anchors and inspires this book. 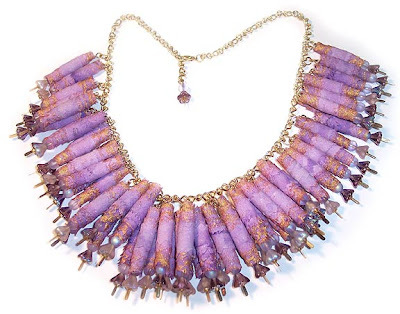 Rachel Nelson-Smith, besides being an amazing bead artist (remember Seed Bead Fusion? brilliant!) is also a jazz singer, so it makes perfect sense to me that one passion would end up being the inspiration for another. I can totally get behind that. With Rachel, you expect that you're going to see wonderful seed bead designs, using peyote or right angle weave, or more frequently a combination of the two. Combining stitches is what allows her to construct deceptively intricate forms which usually break down to be quite attainable for anyone with some experience in the two stitches. There are 23 gorgeous projects to challenge you. While many think that beads do not go beyond the small white circles that carried initials that you used to spell out your name as a kid, there is in fact a huge diversity of beads available. String beads of varying sizes and shapes together to create an uber-chic and unique look that no one has. Be bold with beads! Ribbons are no longer just for ballerinas. 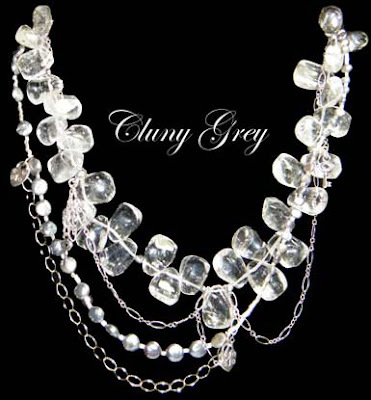 A metallic ribbon in a neutral/earthy color like grey can give your piece an extra shimmery effect. Place an assortment of beads (bugle beads compliment metallic ribbons very nicely), pearls, and semi-precious stones that you have around your home on the ribbon and create a dazzling bead and ribbon combo. 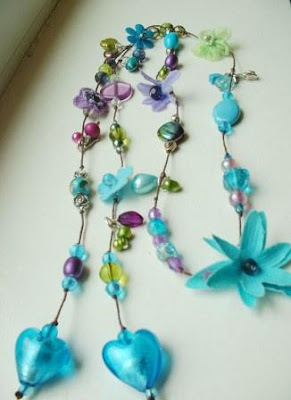 This type of jewelry is also a great way to re-purpose any broken and unusable jewelry. Dye is to die for! 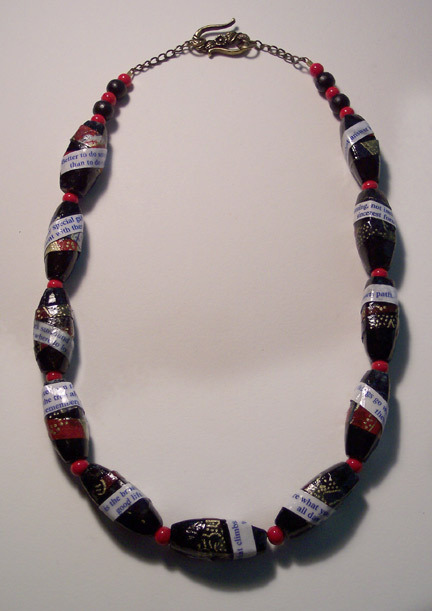 Using beads made from wood is the easiest and creates the best results. A quick DIY dye job can give your string of beads a more earthy - and almost vintage - touch. Dye is a great luxury-building tool because it is so versatile; for instance, you can opt for a simple and elegant monochromatic piece, or you can alternate with all of the colors under the sun. There are infinite color combinations to implement , so get creative and pick tones that will complement your wardrobe. Best of all, if you feel like your creativity got a little too out of hand, no worries - you can always re-dye and repeat until you get it right! A great way to make beads look like one-of-a-kind concoctions is to create crazy geometrical patterns that harken back to the art deco and vintage glamour of the early 20th century. 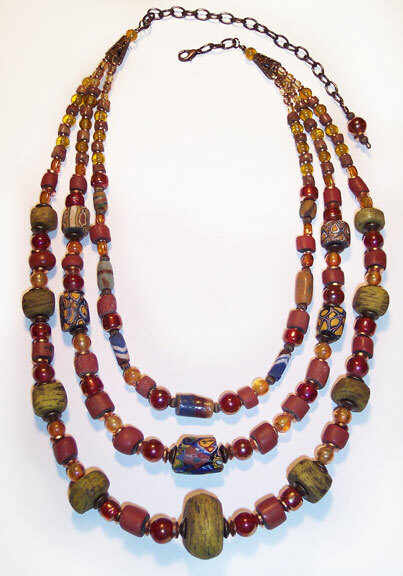 Wooden beads are not only great for dye jobs, they are also easily manipulated and sturdy enough for eccentric patterns. 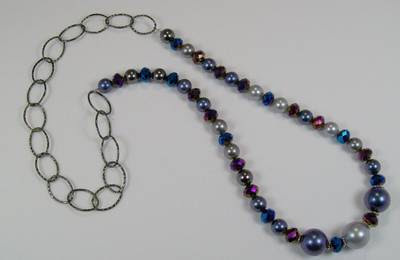 For instance, with the right wire string you can use wooden beads to create basic interlocking loops. Looped wooden beads can create exotic patterns and add hints of tribal chicness to any piece; try this look because these days, tribal fashion is sashaying down the top catwalks from Milan to Paris. If you thought that sequin had stayed in the 80s, think again. Fashion is always cyclical, and sequin has definitely made its comeback. Choose your chunkiest beads and wrap them in any color of sequin that you like. Experiment with alternative sizes and see which combinations you like the best. The only potential pitfall to using sequin is that if you overuse it, it could look like you are wearing tacky Christmas ornaments. If done correctly, however, sequin is a very fun material that is perfect for adding a bit of shine to a light-hearted jewelry piece. Sculpting and creating jewelry pieces with clay can yield some very earthy and rustic pieces of jewelry - and best of all, you can customize them right down to the smallset detail! If you want to add touches of femininity, glue some sparkling beads to your piece or attach them with strings wrapped around the clay base. Class them up a bit by securing small diamonds or other precious stones into the clay itself. Celebrity fashionista Kim Kardashian is renowned for mixology. In essence, mixology is mixing and matching your expensive, inexpensive and homemade items into one distinct outfit. Perhaps you've got some LeVian or Tiffany & Co. pieces in your jewelry box, in which case consider mixing them in with your own homemade pieces to add that trendy "je ne sais quoi" vibe to any outfit. Let's face it, with one necklace made of beads, you run the risk of looking old-school in a bad way (as in, more like your grandmother than like a fashionable 1950s starlet). One necklace is just so cavewoman chic. 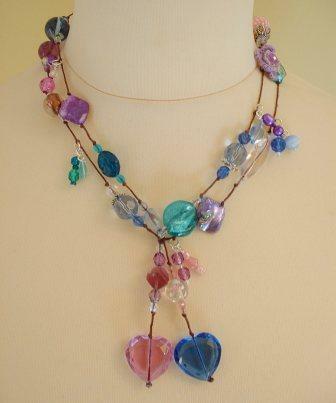 You can speed up to the 21st century by layering lots of your own beaded necklaces together at once. Also, you can play with varying lengths and shapes, customizing them to suit your wardrobe and body type. The art of craft will never fade, but distinct designs certainly can take off and become the next big thing. 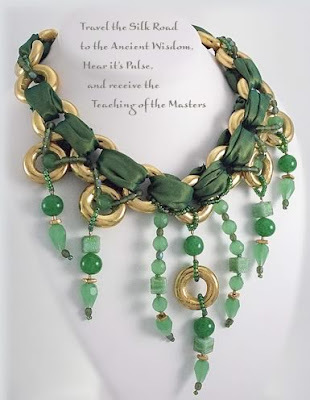 Who knows, your designs might be such a hit that Kate Bosworth, Cher Coulter, and other jewelry trendsetters will come knocking at your door for more. If you've got a smart sense of style, your luxurious homemade jewelry can even end up making you a nice profit, despite the recession. After all, fashion can be taught, but your personal style is yours forever! There's a $100 gift certificate up for grabs at Bumbershoot Supplies! The deadline for entry is November 23, but don't delay and miss out! The November Monthly Challenge is announced, revealing a historical painting of a beautiful woman in autumn tones. This week's Minding the Business is about taking care of you. Jean re-reviews a book by Maggie Meister she finds particularly outstanding. 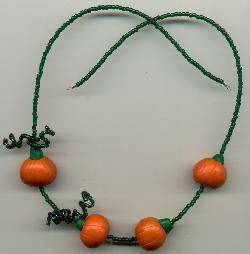 Make a fall patch of pumpkin beads using polymer clay. Do you remember me telling you about a business called Vintage Beads from Europe? Well, the owner, Vente Viteikaite has made it possible for us to have a giveaway here on Beading Arts! The packets of beads that you see above are up for grabs...except for a few of the beads that I've used for projects over the past few weeks. Just leave me a comment below telling me how crazy you are about vintage beads and you'll automatically be entered to win. If you tweet or post on Facebook or other social spots about the contest, you can leave a second comment and be entered twice! Please make sure that your link will lead me to an email address, or else I won't be able to contact you. No contact, no win, and I simply have to go on to the next person. Deadline: November 9, 2011.